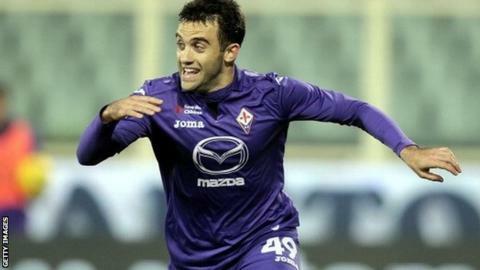 Italy striker Giuseppe Rossi's knee injury is not as bad as first feared although Fiorentina are still waiting to learn how long he will be out for. Rossi sprained ligaments in his right knee in Sunday's 1-0 win over Livorno. The striker, Serie A's top scorer, has twice had surgery to repair damage to the anterior cruciate ligament in his right knee. Fiorentina said the extent of his latest injury would be clearer after Rossi had visited a specialist. "For a correct valuation of the extent of the damage and the outlook, a visit to a specialist will take place in the next few days," read a club statement. The former Manchester United and Villarreal striker had been enjoying a successful comeback season after suffering two knee injuries - the first in October 2011, the second in April 2012. Rossi, Serie A's leading scorer with 14 goals, will be treated by renowned knee specialist Richard Steadman. The 26-year-old was substituted in the 71st minute on Sunday following a challenge by Livorno defender Leandro Rinaudo, who received a yellow card for the tackle. Some sections of the Italian media reported that Rossi would be sidelined for around three months, while Gazzetta dello Sport said his place at this year's World Cup in Brazil, where Italy will meet England, was at risk.